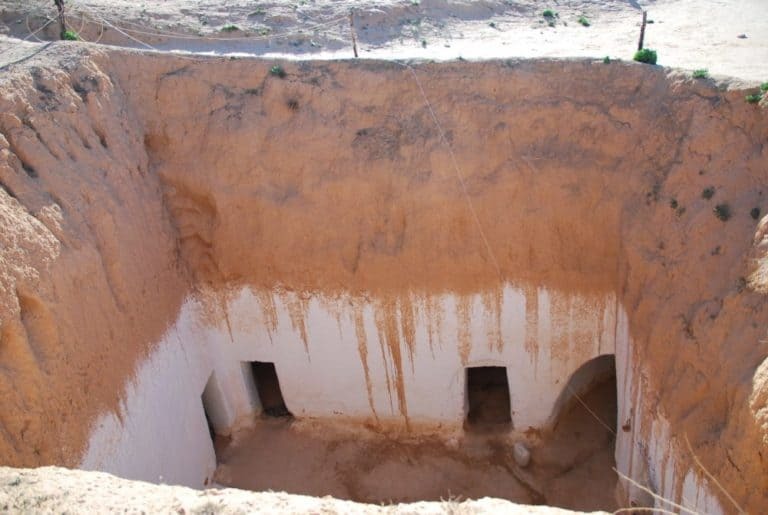 [ Dec.2008 ] In the place called Matmata in Tunisia, there are unusual houses. After digging a big vertical hole in the dry ground, they dig smaller horizontal holes and live there. We visited one of them which was open to tourists. Each horizontal hole was a kitchen, a bedroom and so on and the open-air courtyard seemed a lounge for them. This house had 2 stories, and to my surprise, they went up and down using a rope, like rock climbing. I tried, too, but could not reach as I did not have enough strength. The hostess let us wear the Berber costumes. I like this kind of disguise. The hostess herself were wearing some jersey sports wear, though. According to my guidebook, there are about 500 people living in this sort of houses now. After that, we went to Hotel Sidi Driss just for a visit. This is a place used as one of the locations for Star Wars film. I met someone who actually stayed in this hotel afterwards, and he said it was not very comfortable.